BNP on Thursday paid homage to the 1952 Language Movement martyrs marking Amar Ekushey, the Language Martyrs Day and the International Mother Language Day, UNB reports. BNP central leaders, led by its secretary general Mirza Fakhrul Islam Alamgir, went to the Central Shaheed Minar around 10:10 am and placed a wreath at its alter. As BNP Chairperson Khaleda Zia is in jail, the party leaders did not go to the Shaheed Minar at night. Several hundred BNP leaders and activists gathered in front of Balaka Cinema Hall wearing black badges and went to Azimpur graveyard at 8am. They offered fathea and munajat at the graves of language martyrs there seeking salvation of the departed souls. 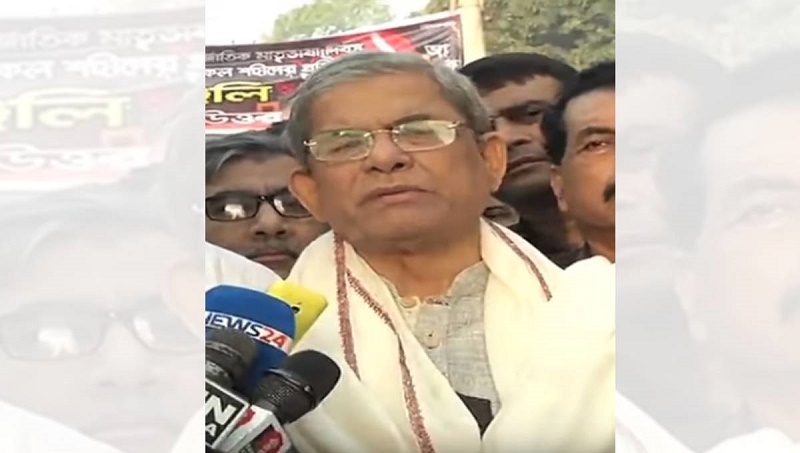 Talking to reporters after paying homage to the martyrs at the central Shaheed Minar, Fakhrul alleged that the government has destroyed the spirit of the Amar Ekushey by annihilating democracy. “The Language Movement in 1952 and the Liberation War of the 1971 were waged based on the spirit of democracy. But it has been destroyed. We’ve now been deprived of our democratic rights. The entire nation has lost its basic rights,” he said. He said the government also imprisoned Khaleda Zia unfairly while thousands of pro-democratic activists have also been sent to jail. The BNP leader demanded the government free Khaleda Zia and other arrested party leaders and activists. He also paid homage to the martyrs of the February 21, 1952 who sacrificed their lives for their mother tongue Bangla which ultimately encouraged the nation to liberate the country through waging the Liberation War in 1971.